Each week, I write this devotional post based on whatever God is speaking to me personally. He speaks to me in my Facetime with Him, and I simply pass it along to you. This morning, I was reading and mediating on Psalm 118, which begins, “Give thanks to the Lord, for He is good; His love endures forever.” Such a great thought to sink into early in the morning! The Psalmist writes about a time when he was “hard pressed” (Psalm 118:5). Ever been hard pressed? I know, me too! Maybe you’re hard pressed for money. Maybe you’re hard pressed with the pressures of your to-do list. Maybe you’re hard pressed with relational difficulties. Maybe you’re hard pressed with decisions. There are a million ways in this life to feel hard pressed! 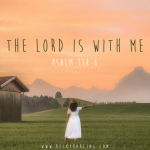 The Lord is with me (Psalm 118:6). Life is stressful and fearful at times. Demands, deadlines, duties, and difficult people all bring elements of pressure to our lives. Even your kids have those pressures. Maybe for them it’s the test they have to take or the bully on the playground, while for you it might be paying the mortgage or dealing with a difficult co-worker. As long as we are living in this fallen world, we will feel hard pressed. But the Lord is with you! What peace there is in knowing His presence and power goes with you into every difficult situation. This truth is so powerful! Open your Bible to Psalm 118 and circle this phrase in verse 6: The Lord is with me. The Lord is my strength (Psalm 118:14). Not only is the Lord with me, but He provides the strength I need to do what He calls me to do (Isaiah 40:29-31, 2 Corinthians 12:9-11). I have several friends journeying through chemo right now. They are clinging to the truth that God gives strength each new day. Friend, you might not have cancer (hopefully not), but you might need strength to deal with your struggling teen or your special needs child. You might need strength today as you wrestle with decisions about aging parents. You might need strength as you battle depression or anxiety. I don’t know what it is for you—I just know that the Lord Himself promises to give you strength. The Lord is God, and He has made His light shine on us (Psalm 118:27). The Lord that you serve is God supreme! He is the Almighty One and He has brought light – The Light of the World – into this very dark world. His name is Jesus! Today, when life feels challenging, remember, Jesus is the Lord God. He is all powerful, He is with you and He promises to give you strength! Please pray for the webinar on March 21 – we’re expecting folks from about 100 different churches to join in! Please pray as Steve and I continue to prepare for upcoming speaking engagements! Thanks so much, Bonnie! I’m looking forward to meeting you as well!